Jordan Readying to Discard Treaty with Israel? Jordan's Abd'allah has capped months of firing increasingly critical comments at Israel with an interview indicating he is preparing to tear up his country's peace treaty with the Jewish state. 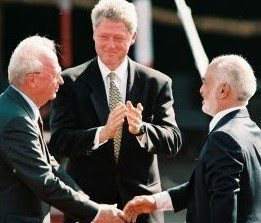 The Israel-Jordan Treaty of Peace was signed in October 1994 - under the approving eye of President Bill Clinton - normalizing relations between the two states after more than 60 years of war, and purportedly finally resolving territorial disputes between the two countries. It was de facto, however, an agreement between the people of Israel - who almost entirely supported and welcomed the treaty - and the Jordanian government under Abd'allah's father, King Hussein; Jordan as a nation did not approve it and many Jordanians have called for it to be annulled. Abd'allah suggested in his interview with the Wall Street Journal Monday that he regretted his father's decision to sign. "For the first time since my father made peace with Israel," he said, "our relationship with Israel is at an all time low. It hasn't been as bad as it is today and as tense as it is today. Like Hussein - the present day ruler has sought to walk a fine line in relations with Israel and the Arab world. He has milked the Jewish state for whatever he can get out of it, enjoying being treated like a moderate and peacemaker by the international community, while keeping the door open to bolt back into the arms of his fellow Arab states when he deems it most advantageous to do so. Apparently this is just such an appropriate time. Israel is - thank Allah, from the Arab point of view - finally well out of favor with the United States of America. Damned as a war criminal by the Goldstone Report, increasingly treated as a pariah by the European states, with Russia and China solidly on board with the Arabs and Iran, and with Turkey daily distancing itself ever further from the southern neighbor it until recently called an ally, the king in Amman may well be gearing up to jump fully over to the other side. The king, who is scheduled to fly to Washington Saturday on an official visit, said he feared for Israel's long-term future.